Welcome to Artane Cycles, Dublin's friendliest bike shop! 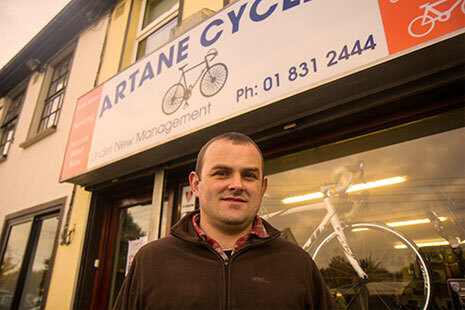 Artane Cycles was founded in June 2012 by Patrick Tighe, Patrick is fully trained bicycle mechanic with 25 years experience in the bike trade in Dublin. We stock all major bike brands including Trek, Marin, Dawes, BH ,Kelly bike, Claud Butler,Focus,Futura,Ignite,Coyote and many more. All of our new bicycles come with a 1 year guarantee and excellent after sales service. We specialise in Road, Mountain and Hybrid bikes with a focus on value. We can offer knowledgeable advice on your bike purchase, our focus is on friendly service. At Artane Cycles we also have a great range of second hand bikes, pop into our shop on the Mask Road in Artane to have a look at our second hand stock. Our expertise in bike mechanics ensures that the pre owned bikes are in top condition, practically as good as new! Our bike repair workshop can cater for any type of repair you need, our years of experience in the business make us the premier bike repair specialist in Dublin. Read more about our repair service here.